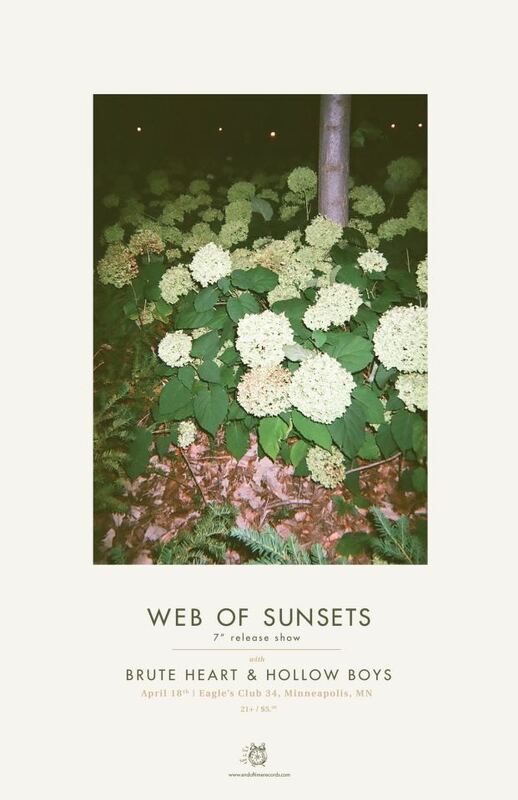 Web of Sunsets’ “Fool’s Melodies” 7″ out now! The debut release from Web of Sunsets is now out in the world. Available as a limited vinyl pressing (on coke bottle green or black) and digitally, “Fool’s Melodies” comes backed with “Neon Blood” — both songs recorded at Old Blackberry Way with Neil Weir. Get introduced to the A-side right here, and for those in Minneapolis, you can swoon as a group at the band’s official release show, this Thursday at the Eagles Club. Tags: acid country, endoftimerecords, eot-002, folk, fool's melodies, minneapolis, release day, single, Vinyl, web of sunsets. Bookmark the permalink. Previous post ← Colored Wimps LPs = sold out!